Our oceans are the source of some of our most delicious and most necessary sustenance. Fisheries and aquaculture are important sources of food, nutrition, income and livelihoods for hundreds of millions of people around the world. 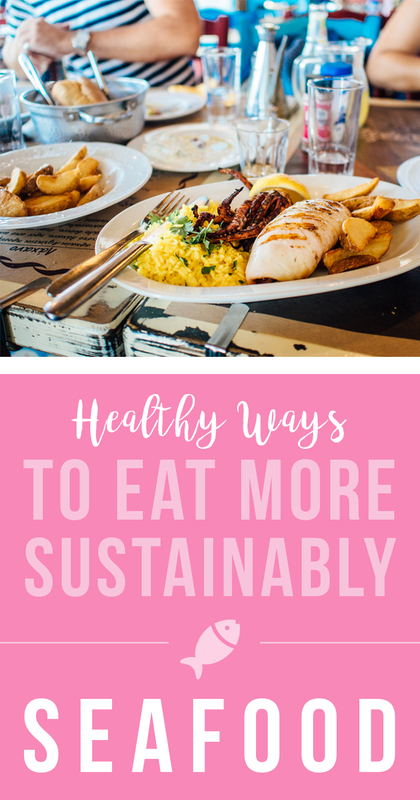 With awareness of the vital part that oceans and inland waters must play in providing food, nutrition, and employment to current and future generations, I have compiled the following healthy ways to eat seafood more sustainably. So enjoy this octopus emoji and read on! By “domestic, I’m referring to the United States. Support American fisheries that are subject to enforceable catch limits, by-catch regulations, and restrictions on destructive harvesting methods like bottom trawling. Increasingly, the seafood we import isn’t wild-caught but farm-raised in poorly-managed factory farm-like conditions where the fish are exposed to dangerous antibiotics and chemicals (many of which are banned in the United States), stored in ice contaminated with bacteria, and even fed animal feces tainted with Salmonella. The USDA only inspects approximately 2 percent of all foreign-import seafood, according to the National Resource Defense Council, so protect your health and our oceans by choosing American seafood. Give farmed seafood its due. Aquaculture products are hard to avoid (approximately half of all the fish we eat now comes from farms) and certain kinds of seafood, especially herbivorous species raised domestically in well-kept ponds, can be a healthy and eco-friendly option. If in doubt, rely on a third-party certification like the Aquaculture Stewardship Council label that is featured on sustainably sourced and caught product. Techniques that traditionally have a bad reputation (bottom trawling, for example) have proven to be sustainable in some applications, by some fishers who have made technological advancements on their gear. The U.S. west coast groundfish fishery is a good example of that, it is MSC-certified. . . Fishing techniques aren’t necessarily all bad or all good, there are exceptions, and MSC tries to focus on, and encourage, the sustainable use of fishing technology. Canned tuna featuring the Marine Stewardship Council’s Certified Sustainable Seafood label. You don’t need them, where sushi is concerned (which is traditionally eaten with the fingers, in any case). Save a tree or two and leave them and their little paper packets on the table. Consider oysters as a naturally sustainable option. Oysters do not require additional inputs such as fish meal (which can cause depletion “upstream” in the food chain). Instead, they filter-feed on tiny particles, plankton, and organic matter found in their immediate surroundings. In this way, oysters are self-sustaining and can actually improve local water quality. The addition of chemicals or antibiotics is not necessary when farming oysters, and farming them can also reduce pressure on wild oyster populations that have suffered from overfishing, pollution, and habitat destruction. View specific oyster recommendations here. Download the Monterey Bay Aquarium’s Seafood Watch app. Get free, up-to-date seafood recommendations on the Seafood Watch app, and search for seafood by common market name, search for sushi by Japanese name as well as by common name, and find restaurants and stores near you that serve ocean-friendly seafood. Eat the smaller fish, or “forage fish” such as anchovies, sardines, herring and mackerel. Industrial fishing poses a serious threat to large fish. Numbers have already diminished significantly. A 2013 study showed that Pacific bluefin tuna, for example, has seen a population decline of 96 percent from unfished levels. Bonus: smaller fish tend to have lower accumulations of mercury. Be adventurous in general, where your seafood is concerned. Expand your seafood tastes, and attempt to try new types often, since popular species often suffer over-fishing and population depletion similar to the Pacific bluefin tuna. Plus, you may discover an uncommon find that you enjoy more than your usual choice! Done! Except for one last piece of advice, the most important thing to remember when faced with the challenges of healthy sustainable eating is: do what you can, where you are, with what you have. Have I overlooked some wonderfully healthy ways to eat seafood more sustainably? If you think so, let me know what I’ve missed in the comments.